The title of this post is the same as that of this article in Rail News. The article talks about the design of the East West Railway. The East West Railway is important for three reasons. It creates a passenger rail link between the high-tech cities of Reading, Oxford, Milton Keynes and Cambridge. There are various sites on the route, where much-needed development of houses is proposed and these would benefit from the railway. Likewise the developments would provide passengers for the railway. Rob Brighouse is chairman of the company setup to build the rail link and he indicates more details of the proposal to reopen the railway. Rob Brighouse says this about the purpose of the railway. The route has changed from being an electrified corridor for freight – part of the ‘electric spine’ envisaged in 2012 – to become a diesel operated commuter railway, at least for the foreseeable future. So it looks like the railway will be built without provision for long and heavy freight trains. But I wouldn’t rule out fast parcels and light freight traffic using diesel or bi-mode multiple units, capable of 100 mph. Would these trains be something like a modern version of a Class 325 train? In practice, this probably means that no provision is made for long freight loops and some of the connections to other lines can be simpler. Nothing is said about whether the design is for a single or double track railway. I doubt there is much money to be saved by adding sections of single-track. The Wikipedia entry for the East West Railway indicates that the Oxford to Bletchley section is proposed to have a 100 mph operating speed. For these and other reasons, I feel that the engineers designing the line, will ensure that it is a double track 100 mph line. The section along the Marston Vale Line would need to be upgraded if 100 mph double-track is the standard. I also think that almost uniquely for a railway in the UK, that the line could be built virtually level with very gentle turns, so that little energy is wasted fighting the terrain. West of Bletchley, there are few if any level crossings, but those between Bletchley and Bedford would need to be removed, if the railway was to be built as a fast and smooth line. Rob Brighouse said this about electrification of the route. I am not planning on making specific provision for electrification. If there are locations where it can be accommodated at a sensible price and it’s much more effective today than tomorrow then we will certainly look at that, yes. I will review the work that has already been done to adjust structures on the Bicester-Bletchley section. If it creates many abortive costs by cancelling that work then obviously that will inform the decision, but if the work can be done later then that’s what I’ll be looking at. At the moment we are looking at a non-electrified route. That is a pragmatic approach. As I said previously, I believe that a well-designed almost-level 100 mph double track could mean that the amount of carbon dioxide produced by an energy- efficient diesel or bi-mode train would not be excessive. The approach would also have these advantages. The route would be available to diesel or bi-mode trains immediately after it is built and certified. Electrification of the new railway at a later date with 25 KVAC overhead electrification would be relatively easy, if the building of the initial line is properly documented. Overbridges, station platforms and other structures could be built or rebuilt with the required clearance for electrification at a convenient time. In the next few years, more efficient battery, hydrogen-powered or whatever trains might be built, which could take advantage of the line. Electrifying the line, only when needed would delay the time, when a lot of money is spent! This document on the East West Railway web site, shows the following services. Due to open in 2022. The current Bletchley to Bedford service will continue. Combined with the Bedford service, Bletchley, Winslow, Bicester Village and Oxford Parkway will get two trains per hour (tph) to and from Oxford and Reading. Winslow will be getting three tph in both directions. Nothing has been said about services to the East of Bedford. There must be endless possibilities, as Ipswich and Norwich are mentioned in East West Railway articles. As to train length, I suspect that this is much on the lines of how long is a piece of string. So will they just start with a four- or five-car train and see how it goes? This approach was tried on the London Overground and the Borders Railway and in both cases, train capacity had to be increased. At least most modern trains like Aventras from Bombardier and those from Hitachi are cut-and-shut trains, that can be easily extended, by adding cars in the middle. The platforms are a bigger problem, if they need to be lengthened. So I would build them long enough to handle two five-car trains working as a pair. The pair of trains could also join and split en-route if required. Two trains start from Ipswich and Norwich. They join at Cambridge and proceed along the East West Railway. They split at Oxford, with one section going to Reading and the other going to Swindon or Bristol. The trains would need end gangways, so passengers could get into the right part of the train. Hitachi already have automatic joining and splitting with Class 385 trains, so that isn’t a problem. The line will be built with the following characteristics. I don’t think that a headway as low as six or even four minutes between trains will be unreasonable. Headway could also be variable along the route. Going from East to West along the route, the following stations are or will be on electrified lines. Sandy – Crossing the electrified East Coast Main Line. Bedford – Crossing the electrified Midland Main Line. Bletchley – Crossing the electrified West Coast Main Line. So it would surely be prudent to run bi-mode trains on the line, so they may be able to take advantage of the electrification at the ends of the line. Bi-mode trains will improve in the next few years with the following features. The ability to change between electric and diesel at line speed. Batteries could handle regenerative braking in both electric and diesel mode and help to asccelerate the train, when running on diesel. The ability to raise and lower the pantograph quickly and without driver intervention. Overhead or third-rail electrification could be used to fully charge the battery, if required. I feel it would be very feasible to use bi-mode trains on the route and they would create less carbon-dioxide than a pure diesel. I would also opt for bi-mode trains with a top speed of 125 mph on electrified lines, so extensions on the four connecting lines with this capability, would be possible and efficient. Strategic short lengths of electrification would make the trains more energy-efficient. Didcot Parkway station sits on the junction where the East West Railway will join the Great Western Main Line. Note the Great Western Main Line going across the map. Reading is to the East. Swindon is to the West. Lines give connection to the East West Railway in both directions. At some point in the future, services on the East West Railway could go to and from the West to perhaps serve Wales and the West. If East West Railway adopt the same policy as they have with the Marston Vale Line, I will assume that other services between Reading and Oxford will remain unchanged. Oxford station will be a key interchange on the East West Railway. I very much suspect though that services will be arranged at Oxford, so that change between local and East West Railway services is just a hop-off one train and hop-on another, or perhaps a walk across the platform. A flyover at Bletchley station takes the East West Railway over the West Coast Main Line, which I discussed the in The Bletchley Flyover. At present trains can also use the flyover to go in both directions between the Northbound West Coast Main Line and the Westbound East West Railway. I also think trains can connect on the flat between the Southbound West Coast Main Line and the Eastbound East West Railway. Will the building of the East West Railway increase connectivity at Bletchley? This picture shows the Bletchley flyover. It is a massive concrete structure. It is almost a mile long. West Coast Main Line is electrified using 25 KVAC overhead wires. Two new platforms for the East West Railway will be built on the flyover to enable interchange with the West Coast Main Line. Services will use the flyover to access Milton Keynes Central station. 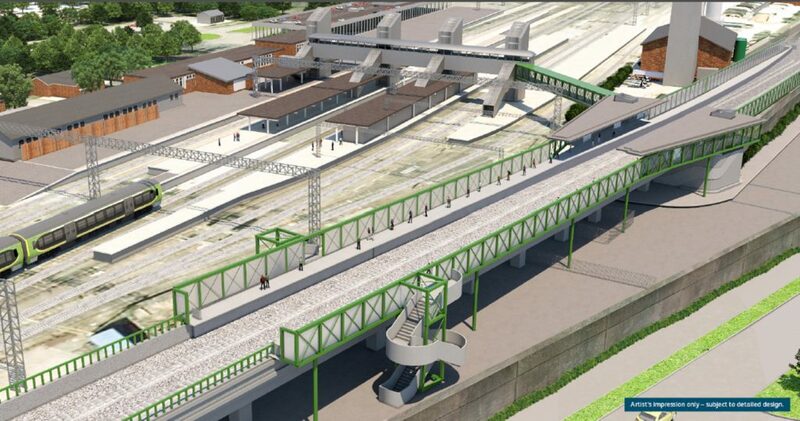 This is a visualisation of how the proposed Bletchley station with the extra platforms could look. I think the architects and engineers have created a good design. A new entrance to the station on the other side of the West Coast Main Line has been created. Interchange between the West Coast Main Line and the East West Railway will be step-free. No electrification of the East West Railway is shown. I also think it could be built for an affordable cost. As substantial work will have to be done on the viaduct, would it be prudent to at least prepare the viaduct for electrification, when the new platforms for the East West Railway are created? 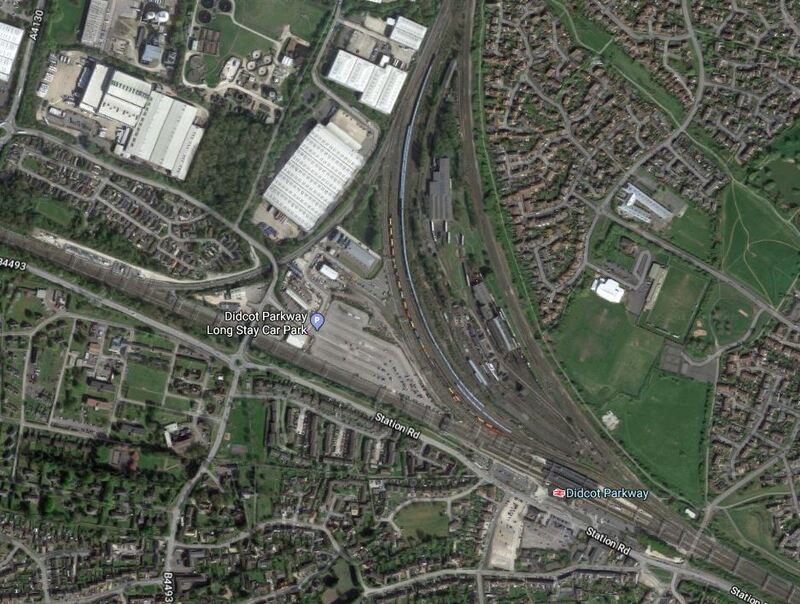 If a short section of electrification was added here will be beneficial for train operation. Bi-mode trains could use it to reduce their diesel consumption and carbon footprint. In future, battery trains could use it to charge their batteries. Electrification of the flyover is a decision for the accountants. But as the company building the line, will also operate some of the trains, they can offset construction against running costs. In the next phase of the building of the East West Railway, which is projected to be completed in 2022, Bedford station will be the Eastern terminus. The service would probably use the existing platform 1A. Under Future Developments in the Wikipedia entry for Bedford station, this is said. Plans were being promoted by Network Rail and Bedford Borough Council for the redevelopment of the station quarter. Platform 1A will be extended through the existing building to accommodate 12-car trains; presently it is only long enough to handle four-car trains and is a terminating bay. Such a platform would be able to terminate trains arriving from. Midland Main Line and Thameslink from the South. Midland Main Line from the North. 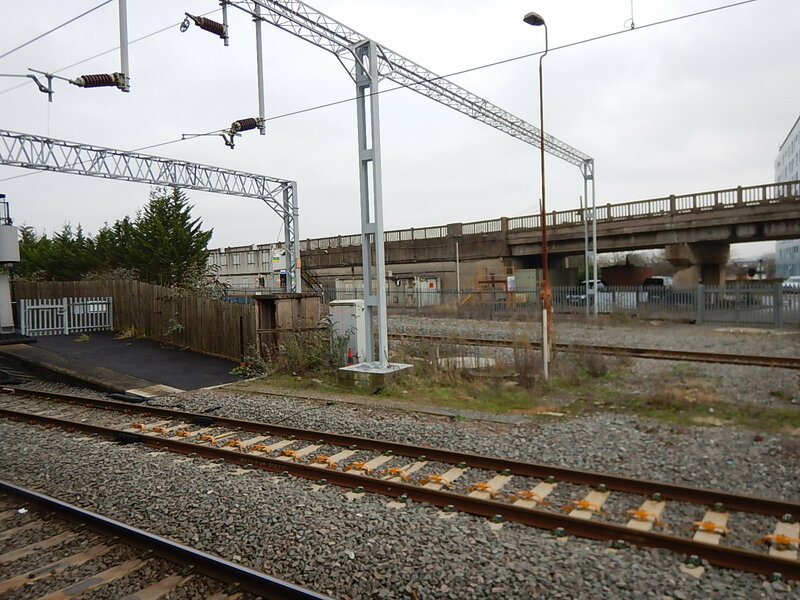 The longer platform will need to be electrified to be able to handle Thameslink trains. But it would enable services from the East West Railway to connect to the North at Bedford along the Midland Main Line. Until more detail is published, I can’t say any more about Bedford. Sandy will be where the East West Railway crosses over the electrified East Coast Main Line. I suspect that the design of this station will build on experience of Bletchley and hopefully it will be a convenient step-free interchange between services on both lines. As with the new platforms at Bletchley, it could be relatively easy to provide a short length of electrification at the station. Only Cambridge on the West Anglia Main Line is electrified on the route of the East West Railway. Wires reach to Ely in the North and Stansted Airport and London in the South. Greater Anglia are going to use Stadler Class 755 bi-mode trains on lines without electrification from Cambridge to Ipswich and Norwich. The Breckland Line to Norwich could be turned into an almost-level 100 mph-plus line with very little infrastructure to slow trains. The Breckland Line is lightly used, with a passenger service of two tph and very few freight trains. Cambridge to Ipswich is partially electrified. Cambridge and/or Peterborough to Ipswich has a passenger service of two tph and large numbers of heavy freight trains. Bi-mode trains would probably be the preferred choice of train to the East of Cambridge. If you look at the lengths of the various sections of the East West Railway, they are as follows. No section is very long and all would be within the capability of battery trains in a few years. Charging would be at both ends of the line in Cambridge and between Didcot and Reading. But this might not be enough, especially if the trains used battery power at the Cambridge end to reach Ipswich and Norwich. The solution would probably be to add enough electrification at Bletchley, Bedford and Sandy. If battery trains do finally arrive, the East West Railway would be a very appropriate line to embrace the technology. If ever there was a railway, where new technology would be understood and welcomed by passengers, it must surely be the East West Railway between Cambridge in the East and Oxford and Reading in the West. One big advantage this route has over others in the UK, is that I believe it could be built almost-level with perhaps the biggest gradient being climbing over the Bletchley flyover. The energy needs of a modern train could be low. Hydrogen-powered trains are effectively bi-mode trains with batteries, that use a hydrogen-powered power-pack instead of a diesel one to generate electricity when needed. In this Press Release, Alsthom give a lot of details of their hydrogen-powered Coradia iLint. 1000 km range on a tank-full of hydrogen. Alsthom have received their first order for fourteen trains from Germany. I believe, that once they are fully developed, they could be ideal for the East West Railway. This may seem bizarre, but read Solar Power Could Make Up “Significant Share” Of Railway’s Energy Demand. I believe that small solar-farms with batteries could be used to advantage on this line. The line could be designed almost level and could have very low traction power consumption. Much of the route goes through open countryside, where people don’t seem to object to solar farms. Third-rail electrification could be installed at stations and for perhaps a kilometre on either side, to charge batteries on trains. The electrification could also accelerate the trains on their way. Power to the track would only be switched on when a train is present, thus reducing consumption and increasing safety. The electricity generated could power the stations. The East West Railway will have created extra capacity in a loop round London, that Rob Brighouse will be free of slow, heavy freight. I believe that train operating companies will make use of the new route. It will be a 100 mph double-track railway with plenty of capacity. If built as an almost level track, it could offer substantial energy savings. It will have connections to four electrified main lines radiating from London. It will be free of slow, heavy freight trains. However, it would need suitable diesel, bi-mode or hydrogen trains capable of 100 mph running. But it could be a very efficient and lower-cost route across England! As I said earlier, I feel the route will also be used by fast parcels and light freight trains based on diesel or bi-mode multiple units. As an example, plans exist to create a major freight airport at Doncaster-Sheffield Airport, which I wrote about in A Station At Doncaster Sheffield Airport. Part of the plan involves, diverting the East Coast Main Line to serve the Airport directly. Amazon already flies parcels into the Airport and these could be loaded onto bi-mode express parcel trains, which could go down the electrified East Coast Main Line before taking the East West Railway to travel to Wales and the West of England. Thjis one tph service is run by CrossCountry and goes via Cambridge, Ely, Peterborough, Leicester and Nuneaton. If CrossCountry were to switch to 125 mph bi-mode trains, might it be an alternative to use the East West Railway and perhaps the West Coast Main Line, where paths will be released once, HS2 is opened. Many of CrossCountry’s services take forever and visit some unsuspected stations. But obviously, it’s what their customers want. I suspect though with 125 mph bi-mode trains, CrossCountry would look seriously about the possibility of using the East West Railway with its connections to four electrified main lines. This document on the East West Railway web site, says that current hourly services between Bletchley and Bedford along the Marston Vale Line will continue. On that section, the long distance trains are planned to stop at just Ridgmont and Woburn Sands stations. Low-performance Class 230 trains planned for the line could slow fast traffic. Especially if they stick to the current journey time of forty-three minutes. Would an express want to get stuck behind a a slow local train? I wonder how fast a 100 mph diesel multiple unit like a Class 172 train could go between Bedford and Bletchley? I think it won’t be fast enough to avoid delaying East West Railway services. So, something radical will need to be done. It might be the solution would be to build that section of the route with three tracks; two for the East West Railway and a bi-directional one for the Marston Vale services. This would separate the fast and local services. There’s certainly plenty of space alongside the current tracks. At least there don’t seem to have been many protests about building the East West Railway. I think we could see the East West Rasilway built in a totally-different way. Track designed for low energy use and fast, frequent trains. Reduced carbon emissions, by the application of new technologies. It could truly be a railway for the twenty-first century! Couple of questions: do you think it will be non-stop (or Didcot only) from Oxford to Reading? And do you think they might join it up with either the proposed Reading to Heathrow, or with Reading to Gatwick? This would minimise terminating trains at Reading saving platform time. As to the first, I think that as it will probably stop in the same platforms at Oxford as the stopping trains, changing will be a hop-off and a hop-on., services will be arranged to be convenient. As to joining to the Heathrow service, that is possible, butNetwork Rail, quite rightly don’t want diesel trains in tight tunnels. I’ll answer the second question in detail in the post later. I think there will be the existing stopping service between Reading and Oxford, which will be augmwnted by two trains per hour fast service to Bletchley with one going to MK and obe to Bedford. Stopping and fast servces will use the same platforms at Oxford. In my view Reading to Oxford needs at keast a four trains per hour stopping service. Ah, ok. I assumed the Reading to Oxford section would take over existing paths, on the basis that the line is already at capacity, so it would be a question of whether it would take one of the fast or stopping paths. But you’re saying you think EWR will be an incremental Oxford to Reading service? With modern signalling and a degree of automatic control, it would be possible to run at least ten trains per hour between Oxford and Reading. Remember too that Aventras and other modern trains save time at every stop compared to the current trains. It is also worth noting that between Bedford and Bletchley they are saying they’ll keep the current stopping service. EWR, GWR and XC will all be running 125 mph bi-mode trains, like Class 800s or Bombardier’s runoured 125 mph bi-mode Aventra. Freight will need to replace the slow Class 66s with a powerful electro-diesel that is faster and more environmentally-friendly. All trains will be running under digital control. Remember, freight will not be using the EWR, although high speed parcelseevices and light freight could well do.